We’re so excited! It was less than two weeks ago that we introduced our fundraiser for the Marsha Rivkin Center for Ovarian Cancer Research, and already, funds are starting to show up at the center. Our first official donor, The Loopy Ewe, donated $1,000, her entire profits for her first sets of the “Egg-stra” Special Socks! Thank you Loopy Ewe! Skacel has sold a total of 1,318 sets in the last two weeks, for a total donation of $19,770! If we combine these figures with the $10.00 match per set we are to receive from Webs and Jimmy Beans Wool as well, we are looking at a current total of $25,570! That is over 25% of our goal and we are only into the first two weeks! And this doesn’t include any matches from any other shops across the USA who are working with us in this endeavor. As we receive donation confirmations, we will keep you posted! If you are in search for a set of these amazing socks, please go to our website for a complete list of shops and all the vital information about the kits! Thank you everyone who has purchased a kit! Obviously, this wouldn’t be happening without you! Way to go knitters! In 2008/2009 we had a fundraiser for the Susan G. Komen Foundation. “Chappy” designed a very clever “Booby Sock” pattern for us, and Zitron developed the perfect color of pink in Trekking, just for this sock. We combined these two into a kit and sold 2,500 of them. We donated $10.00 per kit to the foundation, for a total of $25,000. Now we are at it again, this time raising funds for the Marsha Rivkin Center for Ovarian Cancer Research. This is a cause that is very close to the hearts of my family, as my sister, Susanne, is a three year survivor of ovarian cancer. Unfortunately, being a three year survivor doesn’t mean a lot when it comes to ovarian cancer. While survival rates for other women’s cancers – like breast and cervical cancer – have increased dramatically in recent years, the incidence and mortality of ovarian cancer has remained unchanged for 50 years. This is primarily due to the lack of an accurate, early detection test for the disease. When caught in its earliest stages, survival rates for this type of cancer can be as high as 90 percent. Regrettably, early symptoms of ovarian cancer are difficult to diagnose, are often misdiagnosed, or go undetected, which leads to nearly 75% of all ovarian cancer patients being diagnosed in the advanced stages of the disease. Thus, seven in ten women die within five years of being diagnosed with ovarian cancer and the long-term, disease-free survival rate for advanced ovarian cancer, is only 10%. This needs to change, and we at Skacel would like to be part of that change. One of the best ways we feel we can help is to make women aware of the symptoms of ovarian cancer (please see below), while also helping to subsidize research into finding an early detection test for the disease. To help make that happen, we are very proud to introduce the “Egg-stra” Special Sock Kit. This sock pattern was once more designed by Rosemary “Chappy” Chapman, this time in honor of my sister. The Teal color of Trekking in this kit is the official color designated to ovarian cancer, and has been specially dyed just for this cause. Every design aspect of this sock, from the cuff to the toe, is a reminder to us that ovarian cancer can be beaten if we, as women, unite. Skacel will be donating $15.00 for each kit sold, to the Marsha Rivkin Center for Ovarian Cancer Research (marsharivkin.org). Our goal is to raise $100,000. Kits include the pattern, 1 skein of the specially dyed Trekking, beads, and a card from the Marsha Rivkin Center outlining the symptoms of Ovarian cancer. Kits can be purchased at your LYS. For a list of those carrying the sock kits, please go to: skacelknitting.com. Sock kits purchased online through Webs or Jimmy Beans Wool will have their entire purchase price of $25.00 donated to the center! I would like to personally thank everyone in advance, who may purchase one of these kits, for helping skacel in this campaign to raise awareness of ovarian cancer and help further the search for an early detection test as well as a cure. If you are unable to participate, perhaps you would be willing to help educate your family and friends on the symptoms of ovarian cancer. Please remember, one of the biggest misconceptions is that your annual gynecological visit includes a test for ovarian cancer! This is not so. If any of the following symptoms are NEW and PERSISTANT for 2-3 weeks, please contact your doctor: abdominal bloating, discomfort or pain, lack of appetite, frequent urination, constipation, lack of energy, vaginal bleeding, nausea and diarrhea. Many of these symptoms seem to be every day occurrences with women, and that is why ovarian cancer frequently goes undetected in it’s earliest stages. Be aware of your body and when in doubt, contact a doctor! 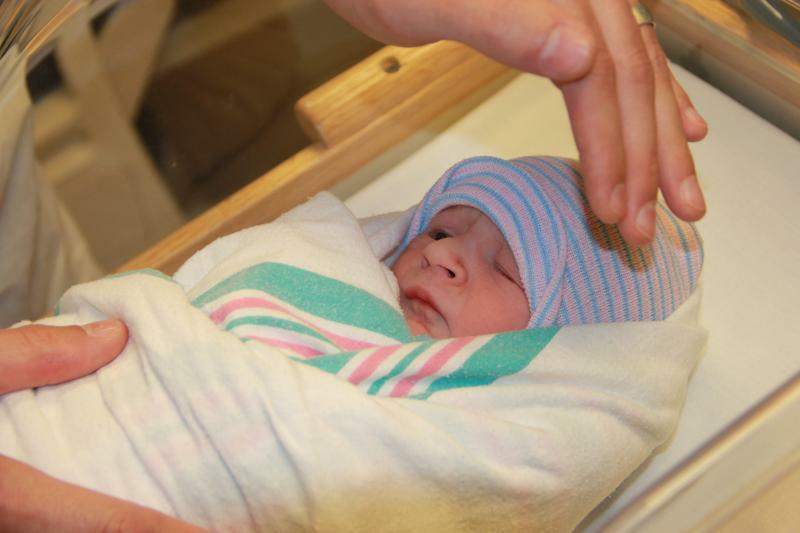 On August 6th 2010, Skacel‘s graphic designer Candice Bledsoe along with her husband Ian welcomed their sweet baby boy into the world. His name is Toby Duncan Bledsoe, and he is a very healthy 7 lbs 5 oz. He’s the spitting image of his proud and loving parents. Both mom, dad, and baby are at home resting comfortably. While a prescription of rest was issued, true to her graphic design roots, Candice could not resist sending us these beautiful pictures of her new son. Congratulations to the whole Bledsoe family! It was a beautiful evening as fans filled Safeco Field to watch the Seattle Mariners take on the Texas Rangers. Equipped with yarn, needles, and charisma, hundreds of knitters filled the upper deck for Seattle’s 6th Annual Stitch ‘n Pitch! 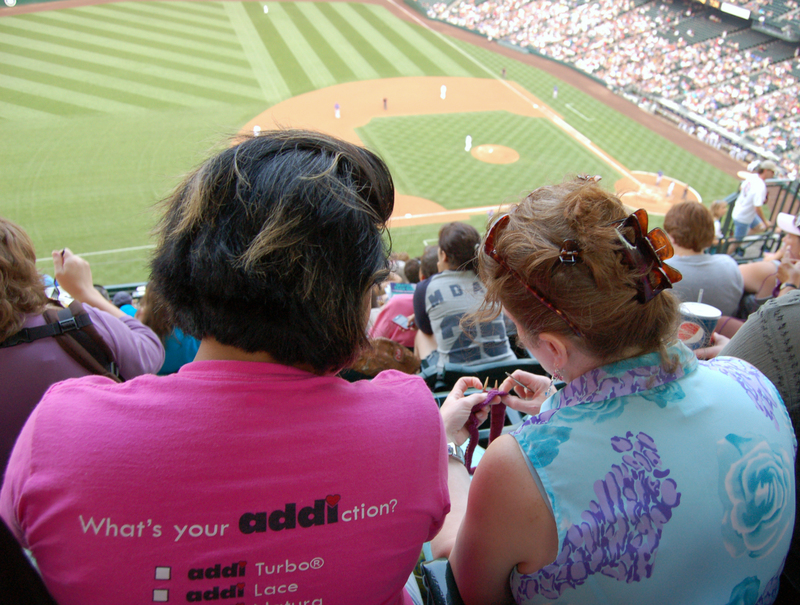 The 300 level of Safeco Field was turned into a temporary knit shop as knitters walked between dozens of booths set up by local yarn stores, designers, and knitting organizations. In addition to the great shopping that was available, each Stitch ‘n Pitch participant received a limited edition Mariner Moose Bobble head covered in yarn! Many Skacel employees along with their family and friends attended. 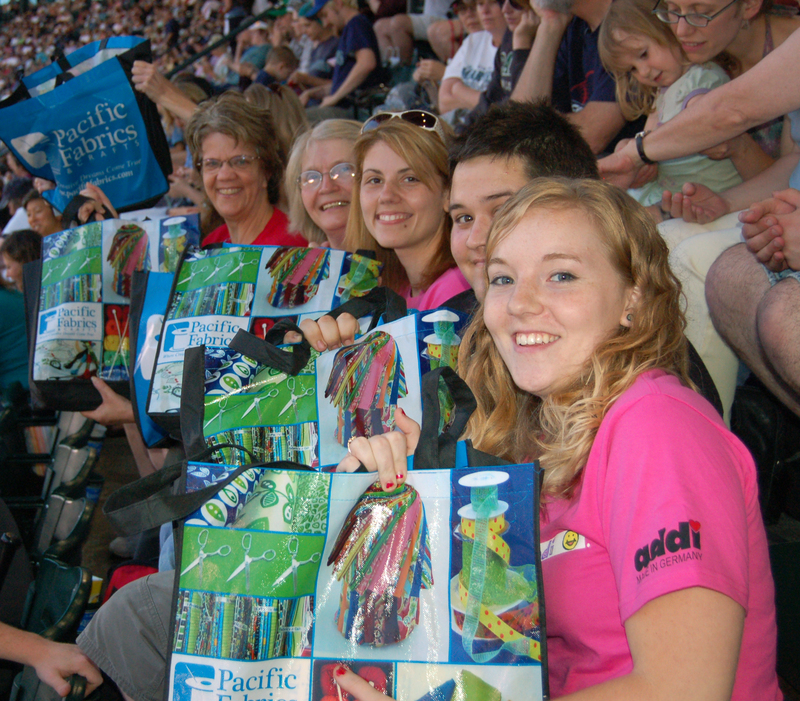 A few lucky employees were sitting in the right row, as their row was selected for a special “goody bag” filled with pattern books, roving, yarn, and knitting accessories. Famous knitter and author, Debbie Bliss, threw out the first (and probably most exciting pitch) of the game, as the Mariners lost 0-6. 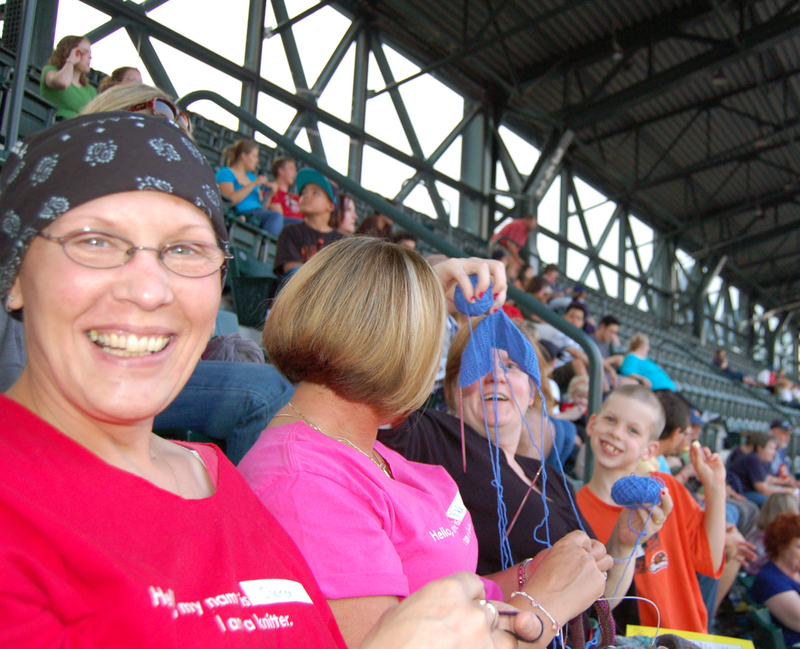 Regardless of the score, though, the crowd was great, the knitting was great, and the 2010 Mariner’s Stitch ‘n Pitch was once again a great event, and Skacel would like to thank everyone who participated!